Squashes belong to the five species of Cucurbita genre and they are believed to be as old as 8000 to 10,000 years, originating in Mesopotamia. 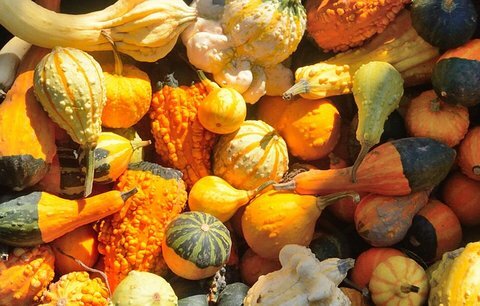 We all wonder how many different types of squashes are there. Well, Squashes may be broadly divided in to two types, depending on their durability and longevity. They are Summer squashes and Winter squashes. Delicate squash is known by many other names like Bohemian squash, sweet potato squash and peanut squash. It is oblong in shape and has a skin that is yellow or orange in color with dark green stripes. The interior is soft, creamy and pulpy, with a taste like that of sweet potato. It is ideal for roasting and stuffing. It is usually baked and consumed, but it may also be steamed or sautéed. Patty pan is small in size and circular and shallow in shape, with scalloped edges. The shape of this squash resembles a toy top or a flying saucer. So it got the name patty pan, which means ‘a pan for baking a patty’. Petty pan may be green, yellow or white in color. Patty pan is a rich source of minerals like magnesium and vitamins like Vitamin A and C, and niacin. One cup of this squash contains about 20 to 30 calories. It is devoid of any fat. So, consuming patty pan provides you with a lot of health benefits. You can fry patty pan till they are golden brown in color and consume them or just boil them and have them. They are even pickled in vinegar. Tromboncino is also known as zuchetta, and is pale green in color and 1 foot long. Compared to other squashes, it has high resistance against pests. It got its name because it has a crooked neck or a curved stem end and it is yellow in color. This is regarded as one of the most popular summer squashes. Zucchini is a long squash which may reach up to 1 meter in length. Usually they are cultivated when they reach up to half a meter or less. It is dark green or light green in color and is very nutritious. Although botanically zucchinin is a fruit, it is included in vegetables and is an important ingredient in many of the dishes. It may be eaten steamed, boiled or baked. Zucchini is low in calories and rich in potassium, folates and Vitamin A. Golden zucchini is a hybrid of green zucchini and is yellow or orange in color. When zucchini is used as a food, they are picked when they are about 20 cm In length. The interior of this fruit is yellow and orange colored and is moist, fleshy and fibrous. The rind of thus fruit is ribbed and hard, but edible. It is dark green and orangey in color. These fruits are acorn shaped and small, and are the most common squashes. They are available throughout the year. You can store these fruits for months in a cool and dry place. The seeds of acorn are also tasty and are eaten after they are roasted. Butter nuts are shaped like a bell and are long footed with thin skins. It has the color of butterscotch and its interior is dense and creamy. In Australia and New Zealand they are known as butternut pumpkin. It has a sweet and nutty taste like that of a pumpkin. Compared to other squashes, these fruits are rich in Vitamin A and C and therefore good for your health. They are the most popular winter squashes and liked by majority of the people. This is the largest winter squash and is tear-shaped. It has a hard skin that is orange to dark grey in color. The interior of this fruit is fleshy and yellow in color and very sweet to taste. It has the flavor of a pumpkin and because of its sugary taste, it is widely used as pie filling and for making purees. If properly stored, you can keep them up to 5 months. They become sweeter with time. Pumpkin is deep orange to yellow in color its skin is thick and slightly ribbed. The interior is fleshy and sweet to taste. It is a native of North America and it is cultivated for commercial purpose. Pumpkin pies and purees are very popular with the people. Pumpkin is a rich source of lutein as well as alpha and beta carotene. Beta carotene is necessary for the generation of Vitamin A in the body. The weight of pumpkin ranges from 2 pounds to 8 pounds. Spaghetti is one of the winter squashes that is oblong in shape, with many seed in it. It has ivory, yellow or orange color. Maximum number of carotene is found in orange spaghetti and it also has many large seeds inside it. The flesh of raw spaghetti is solid, which when cooked, fall in to strands and look like spaghetti. So it got the name spaghetti. You can use it baked, steamed or boiled. You may also cook it in the microwave oven. The seed of this fruit are also eaten. You can roast the seeds and consume them. Roasted seeds taste very much like pumpkin seeds.